Easing the difficulty of getting up from a seated position. Raise the head of a bed two to three inches to relieve symptoms of acid reflux or hiatial hernia. Raise tables to become wheelchair accessible. 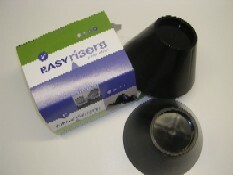 EasyRisers are available in four sizes. Choose between 2” or 3” heights. One size can be combined with a different size to create an incline; elevating either the head of the bed or the foot of the bed. Or, if you prefer, raise your bed, chair, or couch keeping a level position. 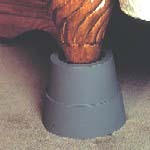 EasyRisers come with adapters and screws to attach to existing furniture for added security. It supports up to 300 lbs and weighs only 1.8 lbs. 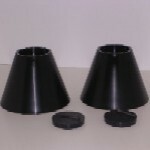 Use EasyRisers in three ways; free standing, semi-mounted, or permanently mounted. The CouchCane offers support with getting up and sitting down on a couch or recliner. If you fear falling when rising to stand or sitting down, using the CouchCane will help you permanently eliminate that fear.